Having a business mentor can really help you advance your goals and avoid some common business mistakes. But not just any mentor will do. 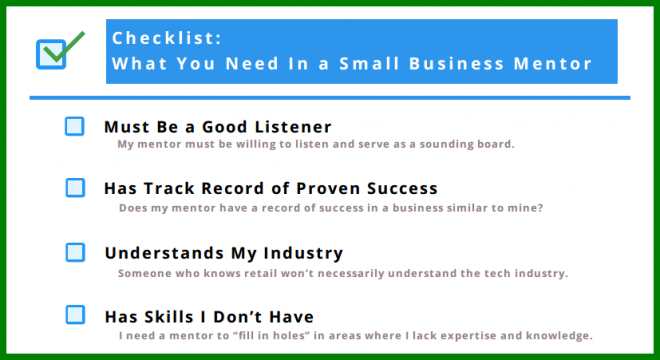 Finding a small business mentor that meets all of the requirements listed below can ensure that you find someone who is going to be helpful and relevant to your business. A big part of your mentor’s job is going to involve listening. They need to be able to listen to your challenges so that they can help you navigate through them. They need to listen to your strengths so that they can help you make the most of them. And they need to listen to your ideas so they can help you turn them into real plans. You can get an idea of your mentor’s listening skills by simply meeting with them and seeing how the conversation goes. The main goal of choosing a business mentor should be to help further your business goals. So a successful business owner who has experience reaching their own goals is more likely to be able to help you do the same. Take a look into your potential mentor’s background and accomplishments to make sure they fit this standard. If their career accomplishments look like what you’d like to emulate, they might just be a good fit for you. It can also be helpful to choose a business mentor who works within your industry, or who at least has knowledge of it. So if you’re a tech entrepreneur, you might not get the most out of your mentor if you choose someone who is successful in the restaurant business. Sure, they might be able to give you some general business insights. But someone who has worked in the tech industry can likely give you more specific and actionable tips for how you can make your particular business succeed. However, you shouldn’t choose a business mentor who’s like you in every way. If you do that, you’re not likely to learn any new skills, since you already know what they know. Instead, choose someone who is similar in some ways, but who has some additional expertise or insights they can share with you. In addition, your mentor’s extra skills and expertise should mean that they can give you a different viewpoint when it comes to certain issues. Sometimes a new set of eyes can be a huge benefit – but you need someone who looks at things differently than you do. Another potential benefit of a business mentor is access to an extended network of relevant business contacts. If your business mentor is successful in your industry, they’ve probably met lots of people who could potentially help your business, collaborate with you, or do business with you in some other way. If you find a business mentor through mutual contacts, this might be a sign that they also have access to more relevant contacts in your industry. Alternatively, you could look into their working history to see some of the companies or industry professionals they’ve worked with in the past. You don’t want a mentor who is just constantly going to tell you what you want to hear. You won’t grow if you don’t ever correct your mistakes. So a good business mentor should be able to notice when you’re doing something wrong and be able to communicate with you clearly so that you can correct it and find a better method for getting things done. Often times, successful industry leaders are also incredibly busy. So choosing one as a business mentor could mean that they don’t have much time to spend meeting or communicating with you. Since you probably don’t want a mentor who’s just going to cancel on you constantly, make sure that you find someone with enough time to spare. Ask them to be honest with you about their schedule, and be honest with them about what sort of communication you’re looking for in a business mentor. You might also find it beneficial to find a mentor who has retired from your industry, since they’re likely to have a more flexible schedule. Values are an important part of running a business. If you’re a business owner who thinks it’s very important to be home for dinner with your family every night, then you probably don’t want to work with a business mentor who’s constantly going to tell you that you need to put in longer hours. Or if you’re dedicated to bootstrapping your startup with no outside investment, you shouldn’t choose a business mentor who is all about finding investors. You don’t necessarily need someone with the exact same style or philosophy. But a good mentor should at least understand where you draw the line when it comes to your business values, and be able to help you navigate tough situations without crossing those lines. Although having a business mentor can be a huge benefit to your business, you need to realize that it’s not a magical solution to all of your business issues. A mentor can help you polish your ideas and plans. But they cannot do everything for you. The actual work is up to you. For Channamallikarjuna and her husband, Debbie’s gesture meant that they had found a new member of their family. 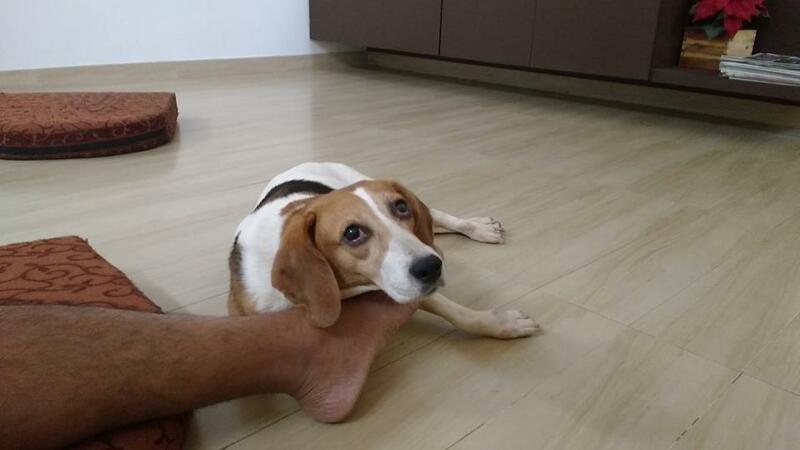 And despite all the challenges associated with getting a seven-year-old beagle acquainted with the real world, the couple took Debbie back to their home in Mysore. 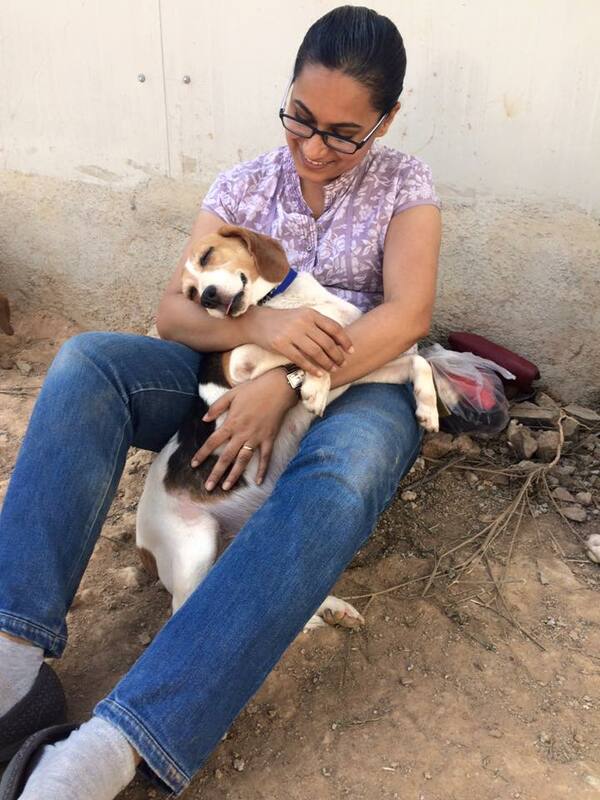 Debbie was part of the third round of laboratory beagle adoptions conducted in recent years by animal rescue NGO Compassion Unlimited Plus Action. Animal testing is legal and beagles are among the most common test subjects along with mice, rats, hamsters, guinea pigs, rabbits, cats and monkeys. As one of the oldest known dog breeds – one that hasn’t been genetically moulded by breeders – beagles are not predisposed to genetic diseases that affect many pedigree breeds. They are also small, compact and easily transportable. 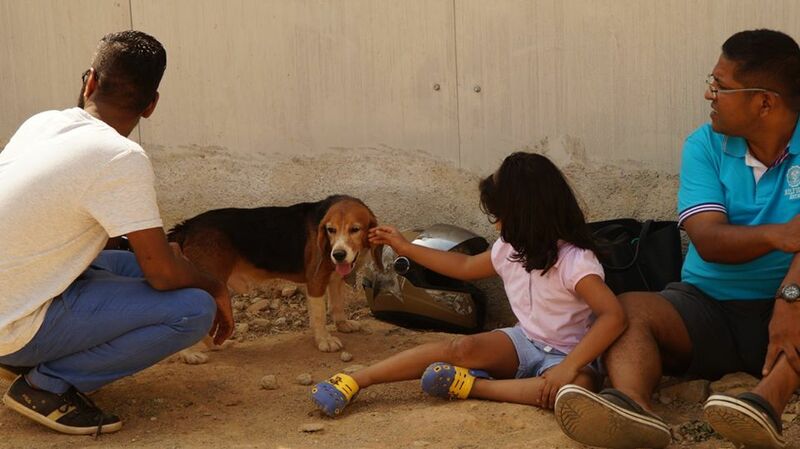 The beagles in the current batch being rehabilitated have not had tests performed on them. Some of them have been used for breeding purposes, while others were in captivity while research projects were pending approval and eventually scrapped. The dogs have been confined to laboratory environments and have spent most of their lives in small cages. 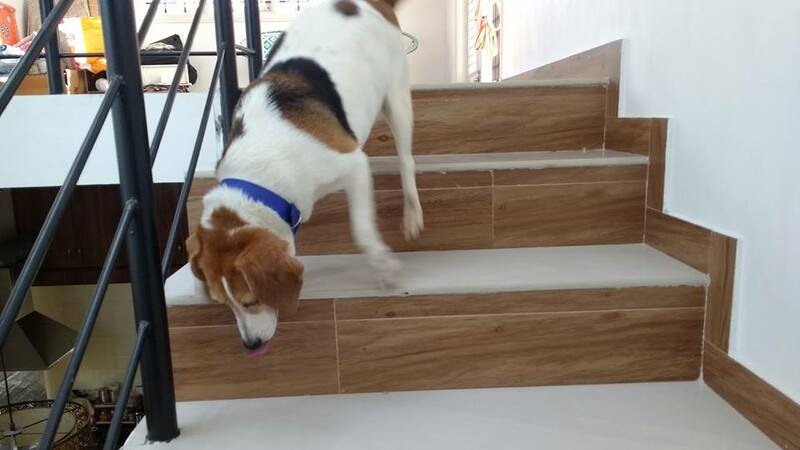 Gopinath has earlier seen dogs as young as a year old or as even old as 11 emerge from the laboratory having been tested with chemicals for drug toxicity. In a few days, around 30 dogs are set for another round of adoptions. The adoption camps are a brief happy interlude in the dogs’ lives. Readjustment and recovery is a long process, as their new pet parents well know. “These dogs have a hell of a time coping with pathogens once they are brought out,” said Srilakshmi Amirtheshwaran, a dog psychologist who has been working with canine adoptions for about 12 years. 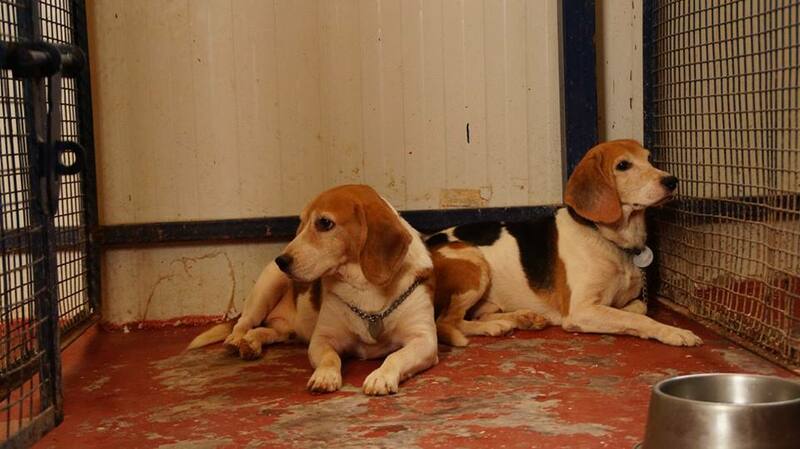 “The microbes in the atmosphere immediately latch on to their underdeveloped immunity and that is a challenge for vets.” Used to near-silent facilities, the beagles are often terrified by noise. The presence of other dogs might be stressful to them and human touch can be intimidating.